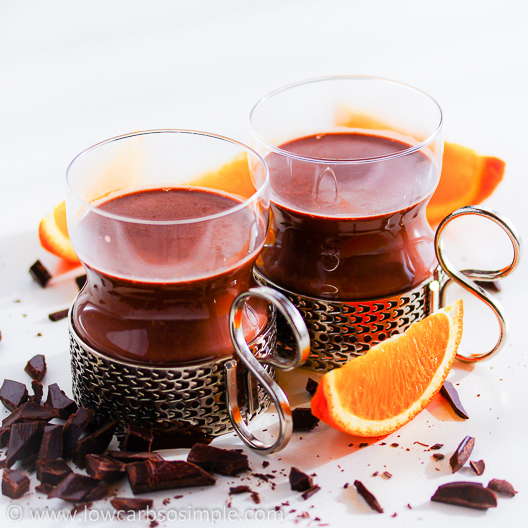 Hot Chocolate with Orange | Low-Carb, So Simple! Take a tea filter or mesh ball and place the orange peel in there. Close tightly. Place all ingredients, including the tea filter or mesh ball, in a small saucepan and heat over medium heat until steaming hot. Don’t let boil. Pour the drink into two heatproof mugs or glasses and serve. You can garnish each serving with whipped cream and freshly grated orange peel. This is one of my numerous recipes which uses freshly grated citrus peel — especially orange peel. Orange peel is one of the staples in my kitchen. The peel gives a full flavor of orange with only a trace of carbs. Actually, the flavor of orange peel is much more complex and elegant compared to the taste of pure pulp or good old OJ. As always, use just the orange-colored part of the peel, don’t let any white pith get in. The white pith gives a bitter and pungent flavor and we definitely don’t want that to ruin this scrumptious chocolate drink. Adjust the amount of stevia to your liking. You can also use some other sweetener, whatever you are comfortable with. I’m sorry for posting this recipe so late. This week just has been crazy beyond belief. I had one linguistics-related project which was supposed to be business as usual, but in the end the task was unexpectedly laborious, if really fun and rewarding. Due to the tight schedule I had to work practically all the days and nights on that project. After finishing I was so tired that I wasn’t able to think — let alone write — anything sensible so I needed to rest for a couple of days and just be with my family. Now I have recovered a bit, and I don’t want to let you down but post this simple and delicious recipe, which I luckily had ready up my sleeve. I developed this recipe last winter and also shot some photos for which I just gave a finishing touch with Lightroom. In fact, this is not the only recipe for this week. A couple of days ago I published a recipe on my Facebook page as well. If you have made the Crustless Low-Carb Pumpkin Pie and happen to have some leftovers, I made an easy recipe for making a good use of those leftovers. If you prefer your drink dairy-free, you can replace the heavy cream with coconut cream. You can replace part of the stevia with vanilla stevia. 10 drops liquid stevia and 20 drops vanilla stevia worked for me. A great addition to adults’ drink is rum or even better: cognac. Café con naranja: replace the cocoa with 1 single or double shot of high-quality espresso. You can still squeeze the juice from that peeled orange and use it for example for Creamy Orange Ginger Chicken, where it fits perfectly. I found your website last week and have been looking forward to trying your recipes. Today is cold and rainy so my husband and I made your hot chocolate with orange and he says it’s the best hot chocolate he’s ever had! The amount of orange is exactly right to balance the richness of the cream. Kiitos! Thanks, Sheilah! It’s great to hear that both you and your husband liked the hot chocolate! I was hesitating a bit with the amount of cream, but seems that 1/2 cup (120 ml) was just the right choice. Thanks for trying out my recipe!